Our last day on this great adventure. We started at 9.30am and left the caravan park then quickly joined the V1. 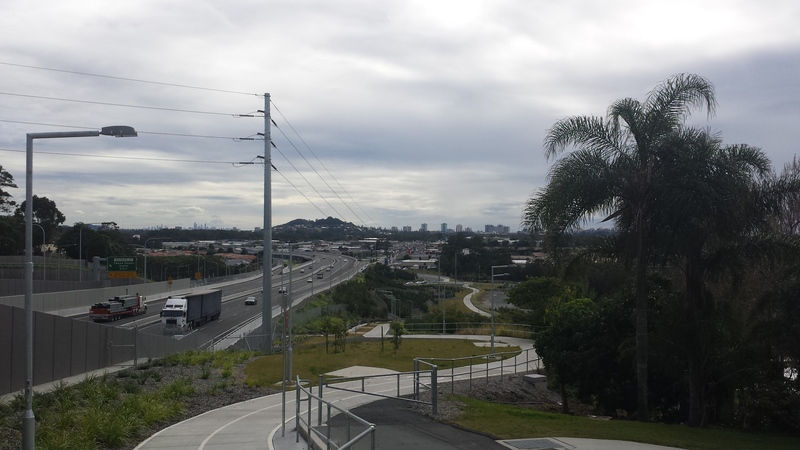 We are now within the Brisbane City limits and the dedicated cycle path was excellent although the signage wasn’t the best. We spent time cycling on the path next to the motorway then through a nice park. 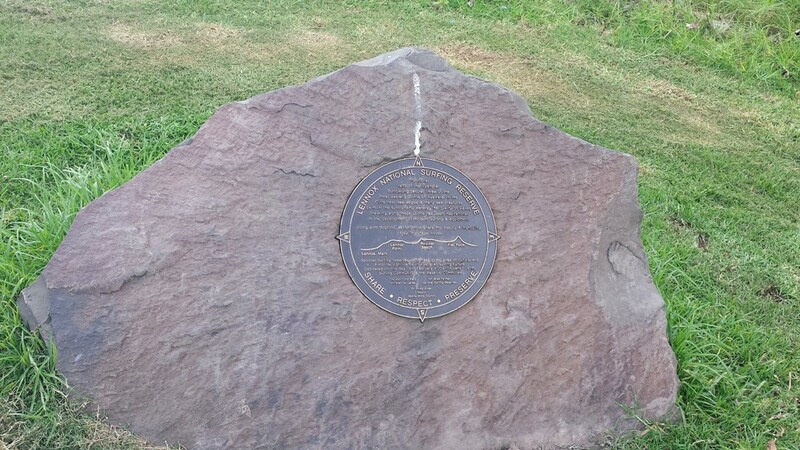 We ended up at Kangaroo Point in the heart of Brisbane. After taking some photos we navigated our way across the jumble of motorway roads to South Bank. South Bank is a nice area with great views of the Brisbane CBD skyline. We sat and had lunch and people watched then carried on biking. 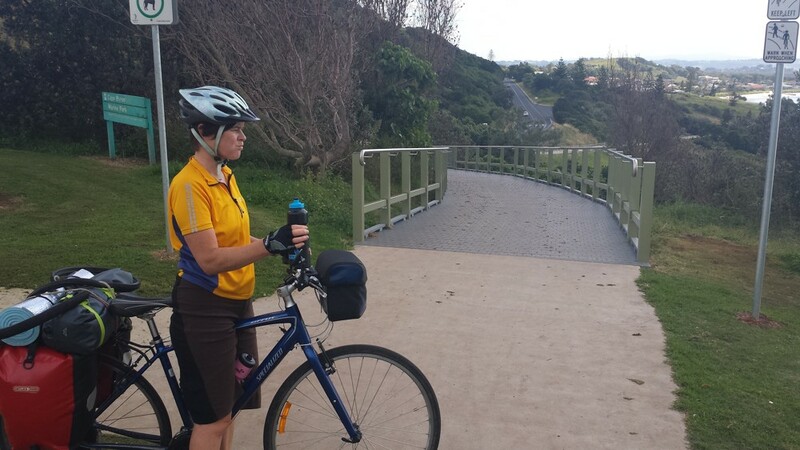 We cycled along the riverbank on a nice cycleway and quiet roads. On getting to Highgate Hill we had to leave the riverbank and cycled up a very steep suburban road, possibly the steepest of the entire trip. Jen walked up the hill but Will wasn’t going to beaten by a hill at this stage of the trip. 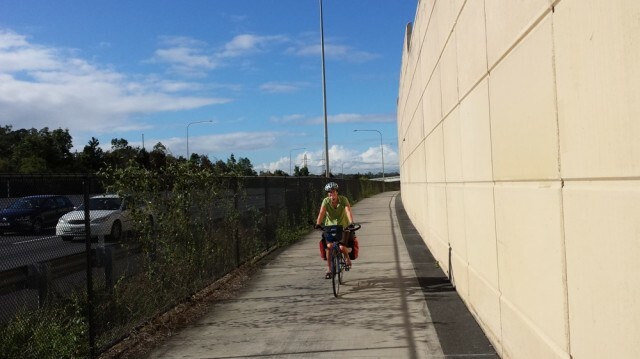 We then cycled across the excellent Eastern Busway bridge reserved for only buses, cyclists and pedestrians. Google Maps did an excellent job with this route as we next cycled through the university then on cycle path all the way to Indooroopilly. From there it was only a couple of km to Dave and Paula’s house. We’ve done it! We’ve cycled 2400km from Melbourne to Brisbane. Today was unusual as we are sad to be finishing while elated to be finishing. We’ve thoroughly enjoyed this trip and have started planning other cycle touring trips. We have a week in Brisbane before flying home to NZ. We’ll write another post or two once we’ve relaxed and got used to not moving every day. Highlight of today: Arriving in Brisbane!! As the title says, today was the second to last day of our cycling trip. 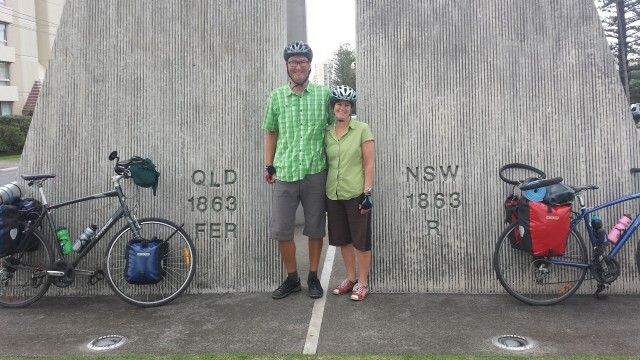 Our plan was to cycle along the V1 which is a bike route from the Gold Coast to Brisbane. We set off at 9am and cycled along the Surfers Paradise promenade heading north. There were good signs which made progress easy. We seemed to cycle through endless suburbs on road cycle lanes. On reaching the motorway we joined the V1 although there were no signs to tell us we were on the main cycle route joining millions of people. The quiet road which travelled next to the motorway was nice to bike on although it was rather disjointed having to cross numerous on and off ramps. The only V1 signs were on the big intersection round-a-bouts telling us which exit to take. It’s hard to imagine cycling this route without the aid of Google Maps on a smartphone. On crossing the border between city councils we found that Logan City didn’t have as much infrastructure but had really good signs. Every intersection had a sign telling us which way to go on the V1 and much of the route was on quiet residential streets. We got to the caravan park tired from the cycling and constant navigating. Tomorrow will be a short and exciting day, the last on our trip. Sorry there are no photos today as we didn’t feel inspired and were too busy finding our way. Note that this map is not the exact route as we got lost a few times. 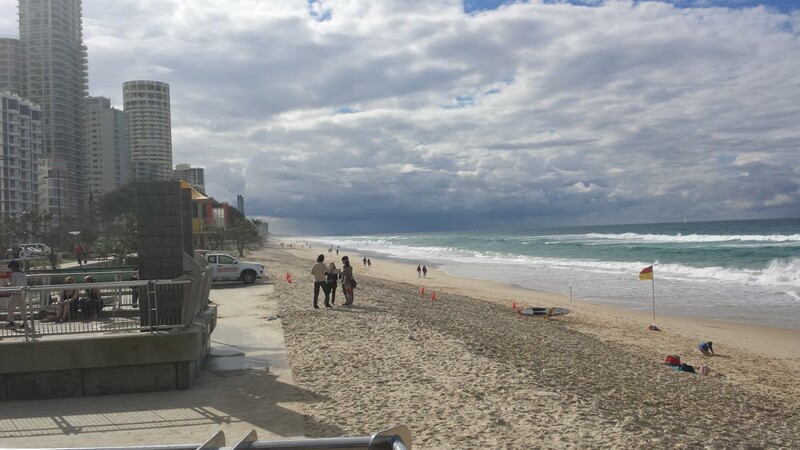 Today we cycled from Coolangatta along the Gold Coast to the tourist hotspot of Surfers Paradise. We started cycling earlier than normal as we wanted to avoid as much of the crowd as possible. Even at 8:30am on a Sunday morning, the promenade was busy with fitness walkers, runners and the odd cyclist. After working our way through the people around Coolangatta the pedestrian traffic thinned out and the cycling was easier though still slow as there is always someone or something to avoid on the promenade. We stopped and chatted to a friendly cycle tourist on a recumbent trike. He lives in the area and uses his bike to commute and do groceries. It was nice chatting about our trip and trips he has done. Not long after that the promenade stopped and walkers could continue along the sandy beach. On bikes we had to bike on the road following a very loose cycle trail with scant signage. We got lost a few times and had to stop often to check Google Maps on Will’s phone. In the end we found it easiest to follow other weekend warrior cyclists as they all seemed to know where they were going. We cycled through the laidback and nice suburb of Burleigh Heads and then as we approached Surfers Paradise the buildings got taller and taller. Surfers is chaos as they are digging up the main street and installing light rail tram tracks which means all traffic is diverted onto smaller roads. 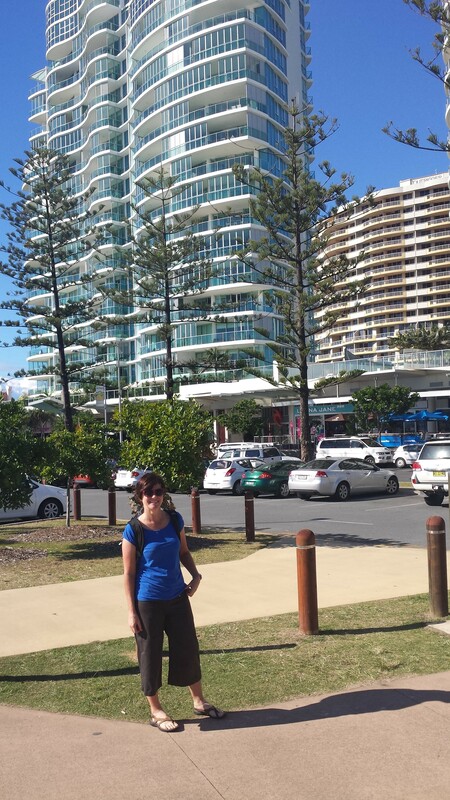 In the end we gave up cycling and resorted to walking the last few km to our hotel in downtown Surfers. 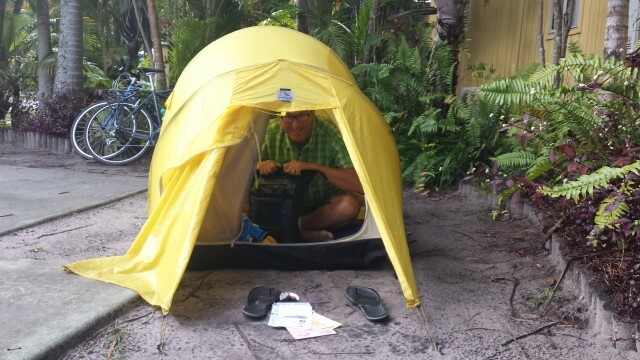 We checked in and got great service from the concierge at the Outrigger Hotel, who helped us store the bikes, get all our panniers to the room and then booked us on a tour. We showered, had a quick curry for lunch then went on a boat trip around the canals and waterways looking at the multimillion dollar mansions. Let’s face it, Surfers Paradise is not really our cup of tea. Think Benidorm without the Spanish influence. Meter maids in bikinis, Elvis impersonators, Ripley’s Believe it or Not, fake Irish bars, flashy excess and skyscrapers. That said, we did have a nice meal at an Italian restaurant and we also enjoyed the view from our 19th floor hotel room. Highlight of today: Chatting to the other cyclist. 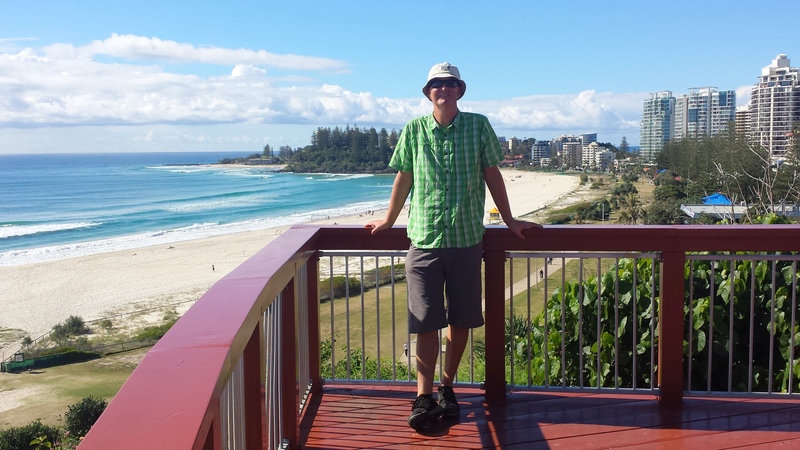 We had the day off today in Coolangatta. We had a sleep-in (Will woke at 6am) and then had Will’s favourite breakfast (marmalade on toast). 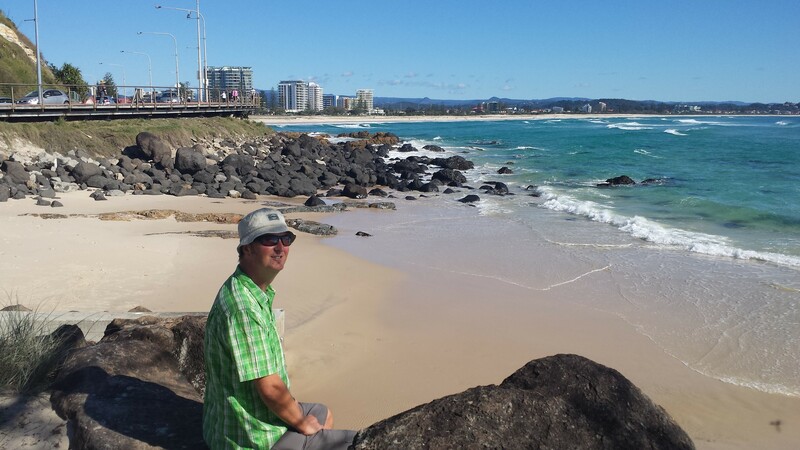 We then went for a walk along the Coolangatta foreshore and spent an hour watching the surfers and SUPers. 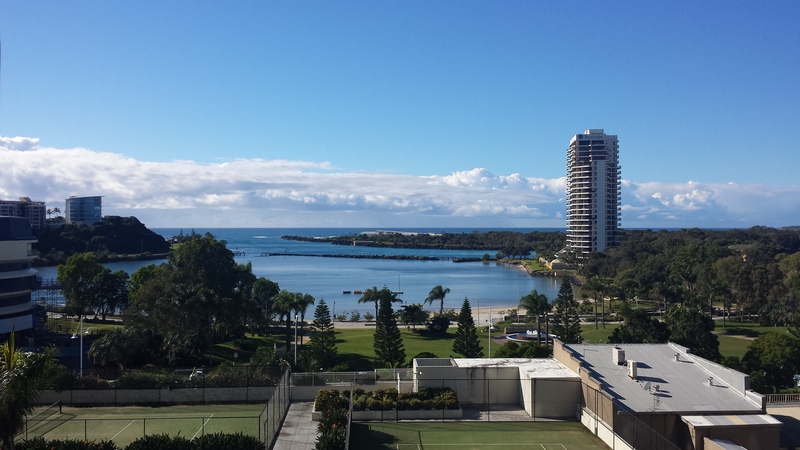 The weather is glorious and we think it can’t really be called winter when it’s 22 degrees C and people are swimming. Maybe another name for this season is needed in this part of Australia. We spent some time planning the rest of our trip. We did some web research then chatted to a friendly man in the local bike shop. 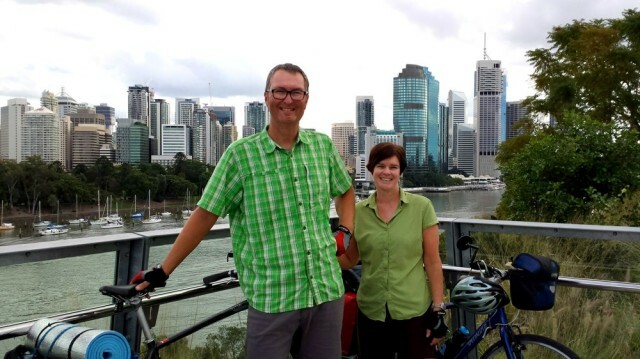 Our plan tomorrow is to cycle along the Gold Coast foreshore to Surfers Paradise. 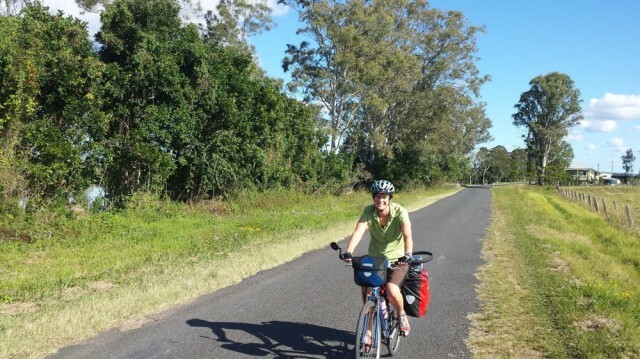 The next day we will cycle along the Veloway 1 (V1) bike route between the Gold Coast and Brisbane. The bike shop man confirmed that would be the best option. 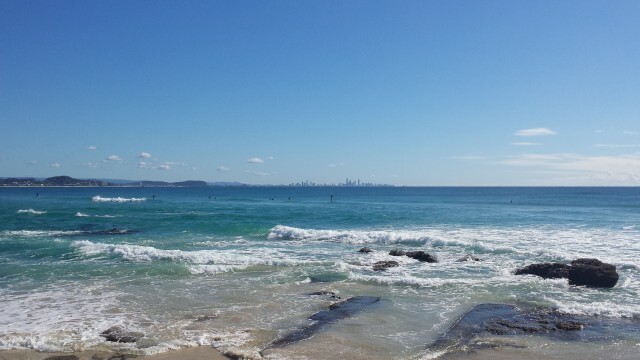 Highlight of today: Watching surfers on a beautiful winter’s day. Note that this map is not the exact route we took as Google does not currently have the cycle path. Today was a varied day of cycling with beaches, the best bike path then motorways and skyscrapers. We started with a leisurely pack-up which might be the last time we pack the tent on this trip. It rained heavily overnight and the tent was very wet so we’ll need to get it out later and dry it. We started biking on a cycle path that ran along next to the road. 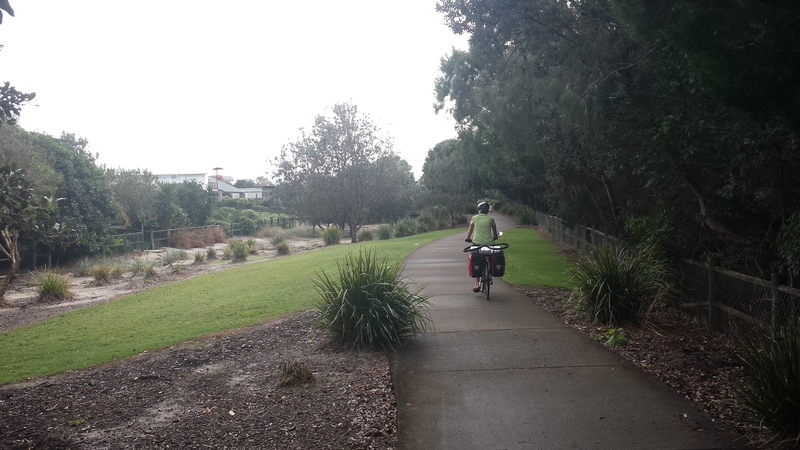 It turned out that this cycle path ran all the way to Coolangatta and is one of the best paths we’ve seen on our trip. Sorry Wollongong and Newcastle, but Tweed Shire trumps you as the best path. We cycled to the next village north where we’d been yesterday with Simon and Gill. We found a café and had a great cooked breakfast. After breakfast we continued on the path next to the road. 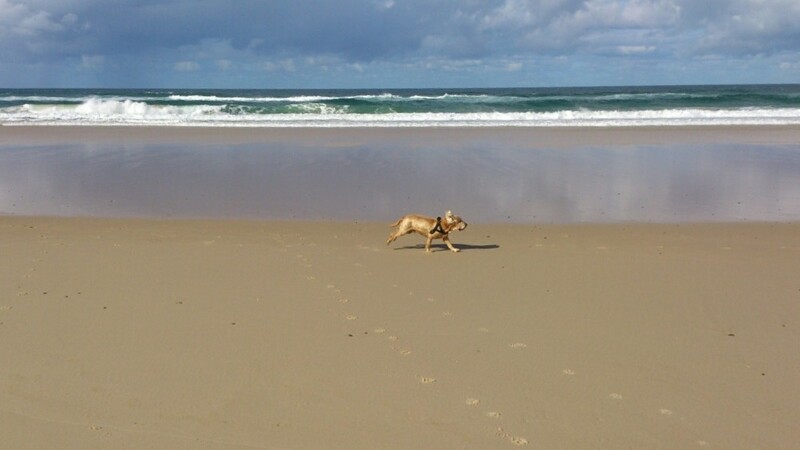 It soon turned towards the beach then went along for over 12km between the flash houses and the beach. The southern part looked brand new and had paved then wooden boardwalk, public art, beautiful seats and constructions. We are very impressed. 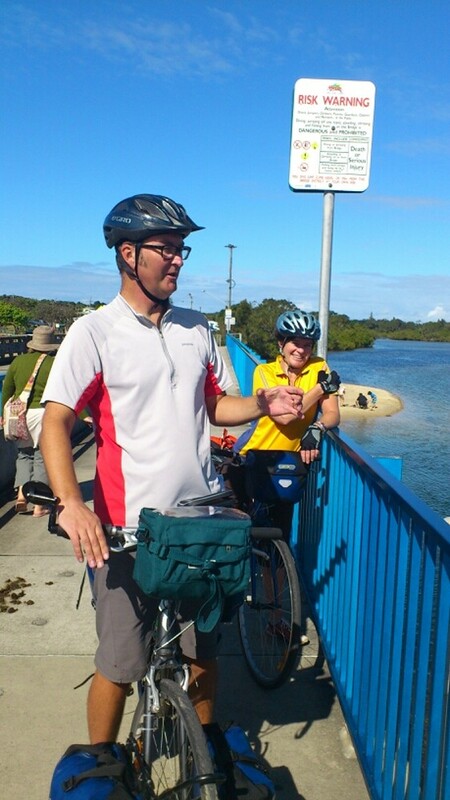 Still on a paved cycle path we then turned into the suburbs and made our way across Chinderah Bay. Next we were on a cycle path that twisted and worked its way along the motorway. Although we were on a separate path, we still felt like this is the world of the car. On reaching the top of a hill in South Tweed Heads, we got our first view of the Gold Coast skyscrapers. Will then couldn’t shake a Johnny Vegas accent (the Lancashire Pub Quiz Champion). We worked our way through the on and off ramps and then along a busy commercial road, past a university and then along the water’s edge, all on a cycle path. We arrived at the border according to Google, but couldn’t find a ‘Welcome to Queensland’ sign. We cycled around for a while looking and eventually found the concrete monument straddling the border. After a few photos we made our way to the conveniently located Outrigger Hotel we’d booked on Wotif. Will told the friendly hotel receptionists he couldn’t find a sign and they joked that Queensland doesn’t welcome people. After checking in we went to the supermarket then mooched around. Today was a nice day biking along great infrastructure. 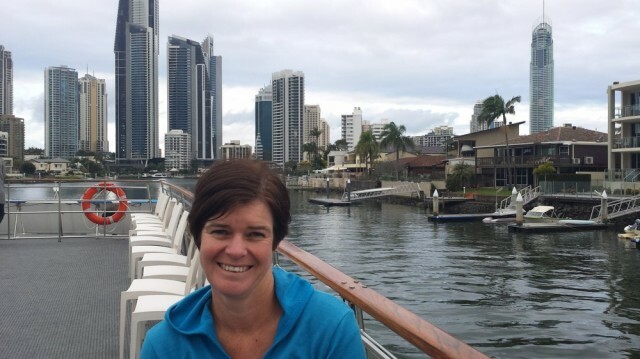 We feel like we have almost finished our adventure and arriving in Queensland means we haven’t got far to go. Tomorrow we are having a day off and will work out a plan for getting to Brisbane. 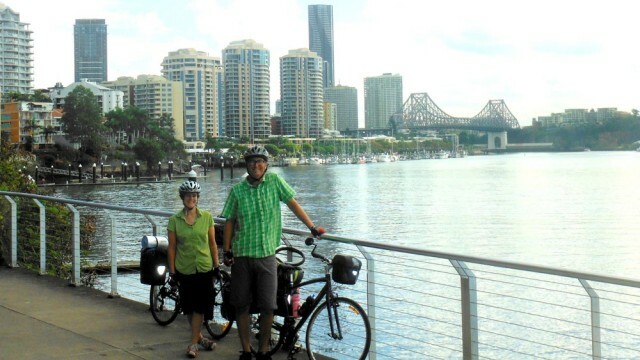 Highlight of today: Amazing cycle path and arriving in Queensland. We had lunch with Simon and Gill today. Through txt and phone calls, we arranged to meet Simon and Gill in Hastings Point for lunch. So we packed up the tent early today and hit the road at 8am. We thought the streets of Byron Bay would be quiet but it turned out there was a large farmers market and there were lots of people about. Byron certainly has a good vibe. We cycled out of town on a great cycle path which just kept going and going. When it did stop we were almost at the junction with the Pacific Highway. Things got a little frustrating here as we’d seen a route on a council website between Byron and Brunswick Heads that followed a small road next to the highway. First thing we found was a sign telling us it was a ‘no through’ road. We decided to cycle down the highway but soon noticed a cycle path in the bush next to the highway. We jumped onto the path but it soon ended with signs to cross the highway. We crossed but there was no path or signs so we crossed back and gave up on the disjointed route. We cycled up the highway on a huge verge with a tail wind. There were great signs showing cyclists where to cross on and off ramps and we felt safe. We flew along and made it to the turnoff in good time. After turning off the highway we took the Tweed Valley Way. A remarkable number of trucks were heading the other way and we soon found out why. We cycled past the site of ‘Splendour In The Grass’, a music festival being held later this month. It currently looks more like a subdivision development and it’s hard to see how it will be party friendly in such a short time. They are certainly pulling out all the stops as a lot of work is being done. We next turned onto a quiet road the followed the beach and went through some small settlements. 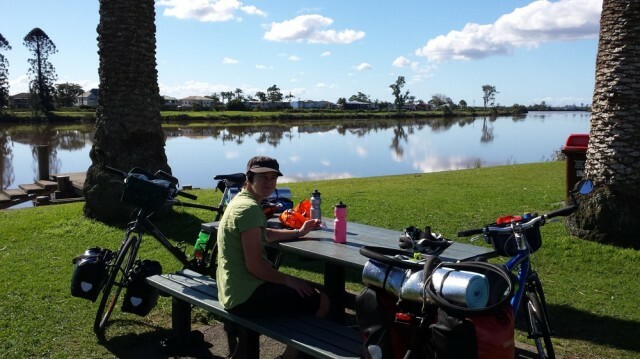 We arrived at Pottsville and had a cup of tea then cycled the last few kilometres to meet Simon and Gill in Hastings Point. We quickly setup the tent then went for lunch and a long walk on the beach with HRH Paddy the Cocker Spaniel. It was great catching up and we will see them again in Brisbane. 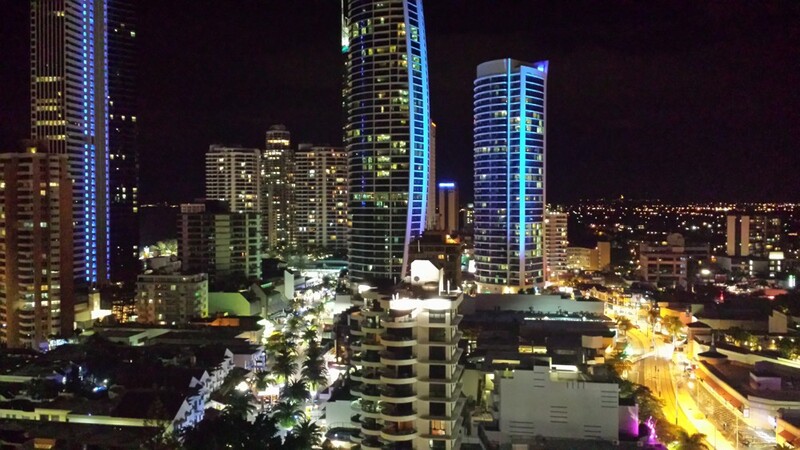 Tomorrow we will be crossing the border into Queensland and biking into the high rise buildings of the Gold Coast. 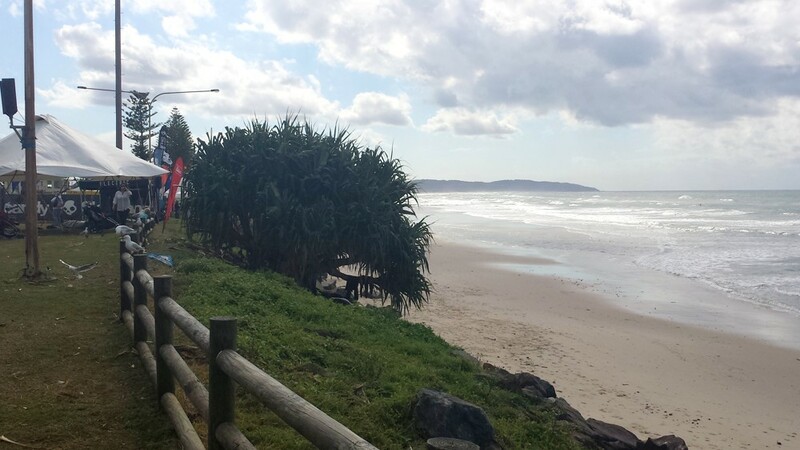 We had the day off today in Byron Bay. As we said yesterday, we’ve been here before and feel we know our way around. That said, we find Byron an unusual place with the mix of hippies and wealth. There seem to be lots of people trying not to conform but in reality if a person wore a suit and tie they would be the most non-conformist person there. We really enjoy the food in Byron and had a great choice of places to eat with a selection of vegetarian food. So often we only have one or two dishes to choose off a menu so to be able to select from numerous vegetarian dishes is a real treat. 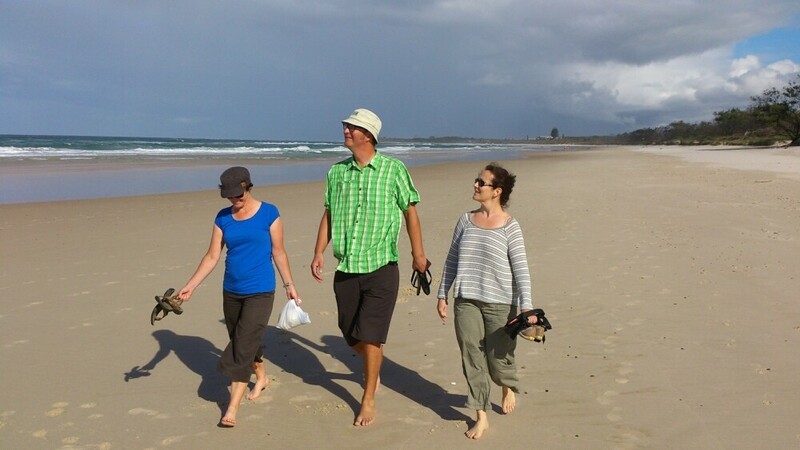 We went for a walk along the beach, ate burgers, and spent some time researching the bike paths in the Gold Coast. Highlight of today: Vegetarian food!! 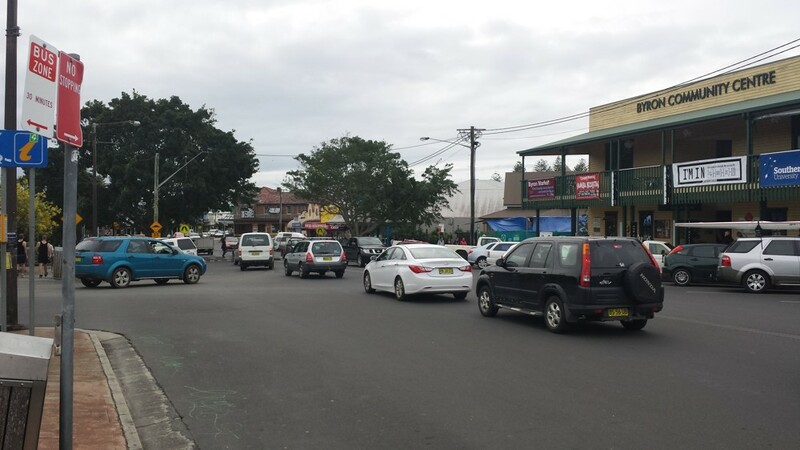 Sorry, only photo we took of Byron today and it’s of a traffic jam. What a mixed day cycling through sugarcane, a massive motorway bypass, a surfing completion then the counterculture of Byron. We started the day with a quick dash down the highway from Broadwater to the next town of Wardell. There wasn’t much of a verge but the traffic was good. We then turned off the highway onto the extremely quiet Pimlico Road. We then cycled past more sugarcane and rural houses. The day had started sunny but as we approached Ballina the clouds got dark and humid. Surprisingly we saw more people mowing their lawns today than we’ve seen on the whole trip. 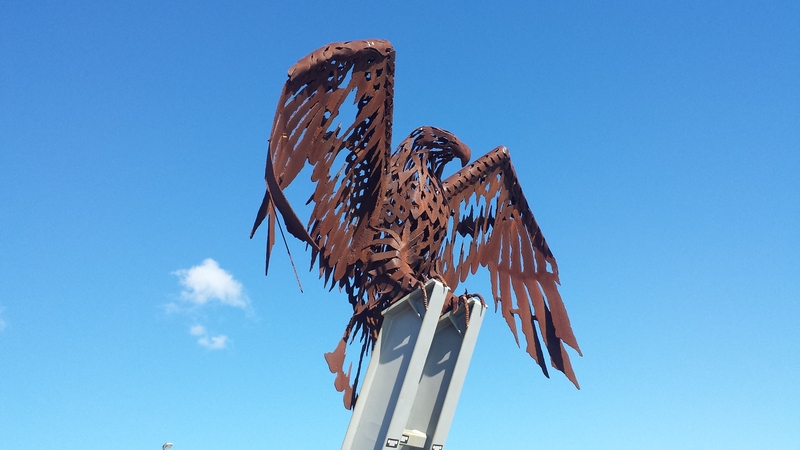 After the quiet country road we joined the highway and entered the newly opened mega Ballina Bypass. It certainly was grand and there was lots of room for us on the wide verge. We turned into Ballina and cycled to the supermarket. 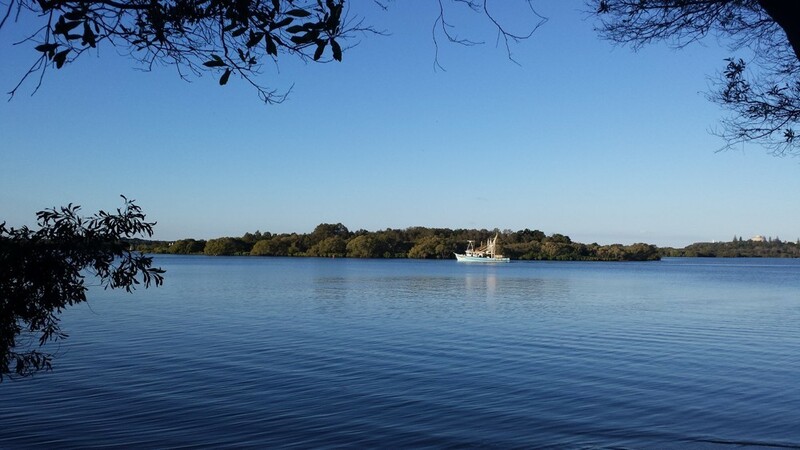 After buying some lunch we cycled on a good cycle path through town and out the other side of Ballina. The weather looked better and after another 8km we arrived in Lennox Head where we cycled down the flashest bike path we’ve seen. 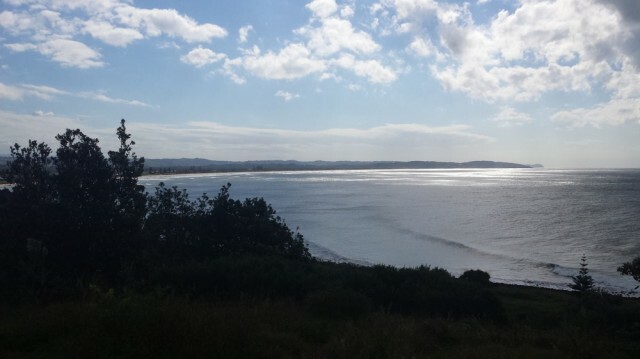 Yesterday we saw on the news that the Skullcandy Gromfest Surf Competition was on at Lennox Head. We arrived just in time to see the final where we saw some great surfing while having lunch. We chatted to a lady who had cycled in the past and was interested in our trip. After lunch it was a quick cycle with a screaming tail wind to Byron Bay. All the drivers were really good as the relaxed culture of Byron must also pervade their driving. It was surreal arriving in Byron as it seemed like only yesterday we were here. Last July we visited Byron Bay with Dave, Paula, kids, Simon, Gill and HRH Paddy the dog so we feel we know the place well. We checked in a caravan park which was full of backpackers and unusually not many Grey Nomads. 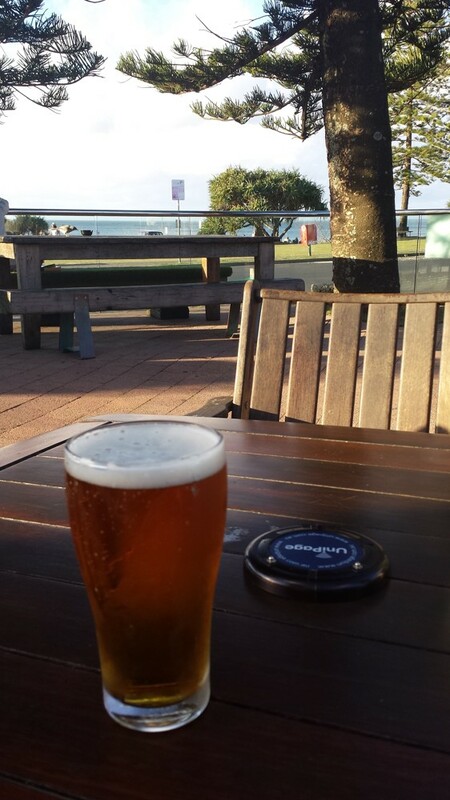 We walked around town and sat in a beach hotel drinking a beer and people watching before going for a curry. Byron has a really bustle of backpacker energy and we think there are more tourists here than all other towns put together on the entire trip. Byron seems to have a permanent traffic jam, people walking the footpaths, sitting in cafes, busking on the street, eating and drinking. It’s like the counter culture of Takaka mixed with the wealth of Queenstown. Highlight of Today: Watching Gromfest and having a beer in Byron. Today was a nice day of biking. On face value it looked like it was going to be a long day on the highway but the road was better than we expected. The day started as normal with us packing up and on the road at 9am. 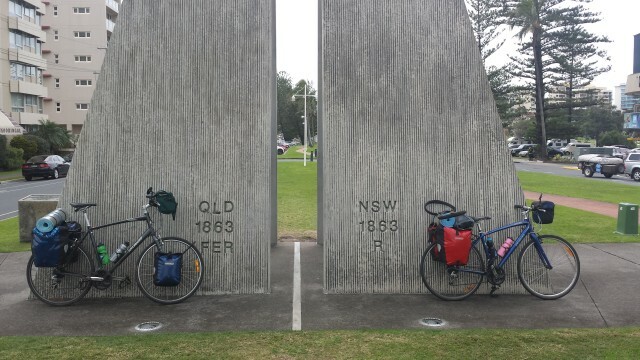 We cycled the first 20km on a relatively quiet road from Iluka to the highway through the Bundjalung National Park. We then joined the highway and cycled along a nice wide verge with the national park on both sides. The traffic wasn’t too bad and we made good progress and arrived in the bustling little town of Woodburn. Obviously this is a stopover for drivers refuelling with food and petrol although it’s funny entering a town with big billboards touting KFC and McD’s 25km away. In other words, don’t stop in this town. We had a snack in Woodburn then crossed the river into another world. 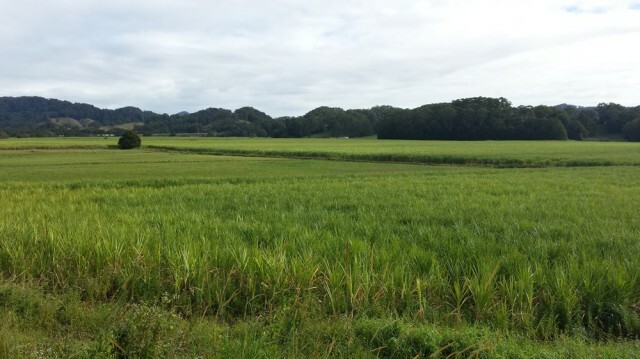 We cycled along an exceptionally quiet riverbank lane with sugarcane plantations on either side for as far as the eye could see. We past some wonderfully dilapidated houses and barns, past men and machines harvesting the cane, and past kangaroos and lots of birds. It was a really nice ride and we saw a couple of other cyclists out for day rides. 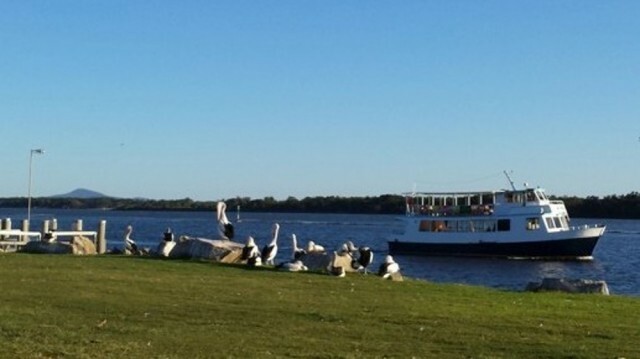 We arrived in Broadwater which is also called Sugartown. 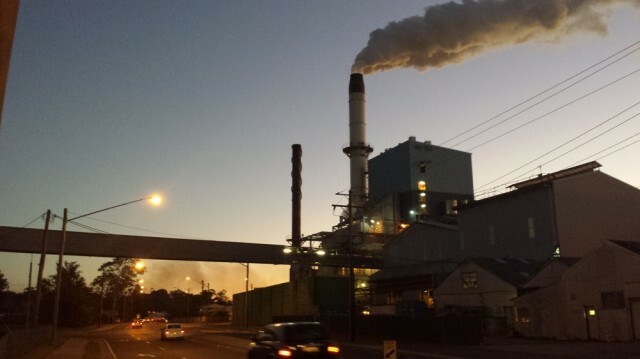 In the centre of the little town is a huge sugar mill where the cane is crushed and sugar is extracted. The process fills the air with a sugary, almost golden syrup smell. We checked into the friendly tourist park then walked into town and had a great vege-burger. Highlight of today: Cycling through a national park and along a quiet country road. We spent a long weekend relaxing with Dave, Paula & kids. On Friday we had a slow start and Dave cooked crepes. After breakfast we drove into town then up onto the headland. 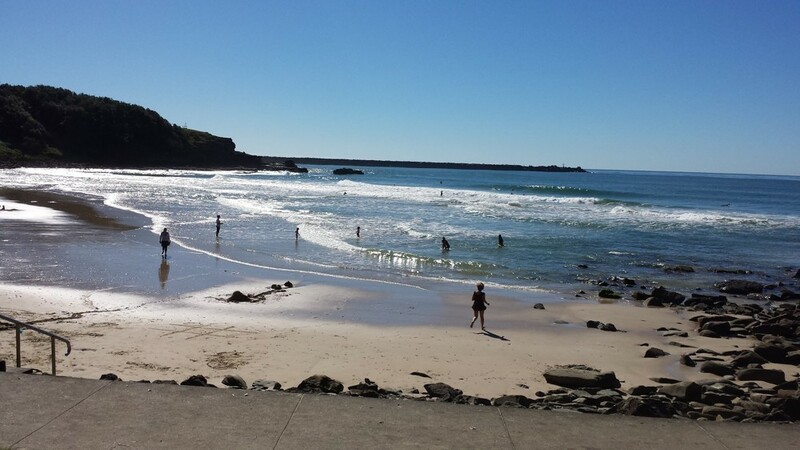 We walked down to a nice beach and explored the rock pools and watched the surfers. For lunch we went out to a café then we spent the afternoon back at the caravan park where the kids jumped on the bouncy pillow, swam in the pool and played at the park. The park is full of kids and it’s great for families. Almost all of Saturday was spent at the beach. 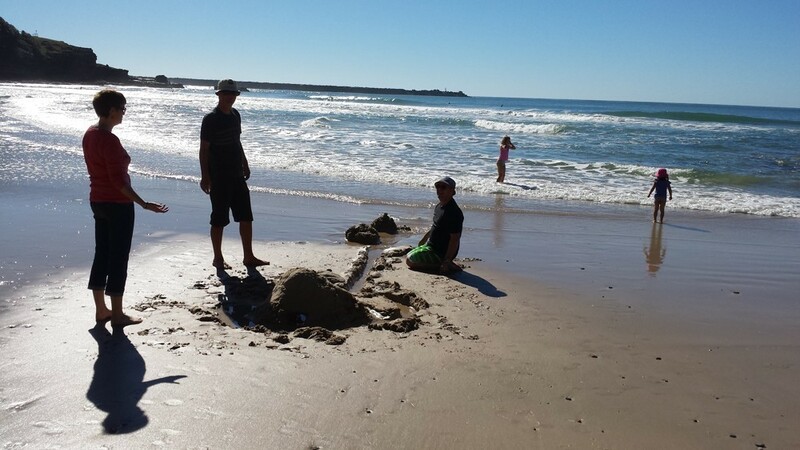 The weather was great and we swam in the sea, made sand castles and had a picnic. It was hard to see how this can be called winter. 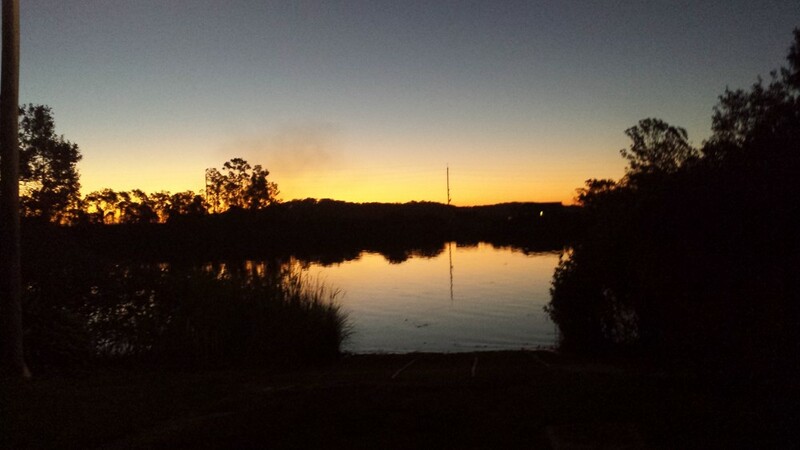 On Sunday the caravan park was emptying out as it was the last day of the QLD school holidays. We packed up and said goodbyes to Dave and Paula and kids. We cycled into town and got to the ferry wharf. We had a nice 45 minute wait for the ferry watching the pelicans. The ferry ride across the river Ikula was lively as there was a lunchtime cruise with a live band. We decided we weren’t going to cycle today as the road would be busy and we were tired after a social weekend. We checked into a caravan park in Ikula, did some laundry, relaxed and planned the route ahead. Highlights: Hanging out with Dave & Paula and kids. Day 65: Where is Coffs Harbour? Day 50 & 51: Great day cycling!! Day 40: What a way to arrive in Sydney!! Day 1 : Wow, what a great start!! I need weather advice from Melbourne friends. Blogging, Podcasting, Facebook or What?